With the kinks worked out from the previous exposition and time travel-heavy Kirk/Spock origin story, and by staying close to the spirit of Wrath of Khan, the most action-oriented entry of the Star Trek episodes, the result is a more focused and thus clearer action sci-fi picture aimed at moderate Trek enthusiasts and summer blockbuster audiences. I admire JJ Abrams as a filmmaker, he seems to have the pulse of a blockbuster filmmaker. First there was the Mission Impossible episode, then the Star Trek reboot, the Spielberg/ET throwback Super 8 and this picture - all remakes, sequels or direct homages to other people’s work. And with his upcoming Star Wars reinvention, it will be even longer before we see an original film from Mr. Abrams. As in his first Star Trek picture Abrams injects into the traditionally formal and glacial Trek asesthetic a heap of cine-gusto, flashy camera moves, dutch angles, lens flares, aggressive music, shakey action choreography and all other tools of buffo action filmmaking 101. With the establishment of Kirk, Spoke, Uhuru, Sulu, Scotty, Bones and Chekov under younger faces and buffer bodies already taken place Abrams’ feels more comfortable jumping right into the story. 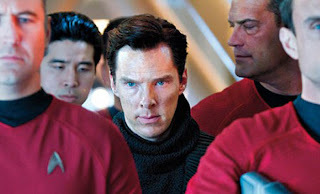 After a terrorist explosion in future London, thus a thinly-veiled post 9/11 allegory, reveals a new sinister villain named John Harrison (Cumberbatch) working against the Starfleet Academy, topper Admiral Marcus (Weller) assigns Kirk and the Enterprise to the home planet of the Kingons to capture. Kirk and company realize there’s a fine line betwene good and bad in this predicament as Harrison comes to Kirk’s rescue after a confrontation with the Klingons. Terrorism has two-faces of evil here, on the home front and the front lines of he battle. Forced to work with his enemy it’s Kirk and Harrison fighting the corrupt Starfleet leaders to stop a prospective intergalactic war which threatens everyone. Admidst the heated action and crash camera moves, Abrams keeps his intra-character conflicts in sight. The logic vs. instinct contradictions of Kirk and Spock receive more attention, both for emotional value and strong comedic relief. Short shrift is given to Bones who gets stuck with the plotty c-story, which Trek fans will see a mile away. Uhuru’s prominent position in the Kirk/Spock love triangle in the previous film is significantly lessoned. Chechov is mostly non-existent though Scotty as the defiant engineer who comes to rescue the crew has increased value and screentime. Trek fans will immediately recognize the Wrath of Khan easter eggs. These become more prominent as the film goes along, eventually morphing into a pseudo-remake of the Nic Meyer film. We realize, by the end, Abrams’ desire to make Trek 1 and 2 as a dual-origin story, with the connections of the future episodes linking the Trek universe together. It’s all done very cleverly, but for discerning Trek fans, too cleverly perhaps. The reappeance of Leonard Nimoy was surely unnecessary (and not explained at all), but name-dropping the ‘tribbles’, the famous “Khaaaan” line reworked and the hints of a Kirk offspring later in the series is all in good fun. And so is the experience of this film.